If you are thinking that Facebook is sitting quietly after being forced to remove its Onavo VPN app from Apple's App Store, then you are mistaken. 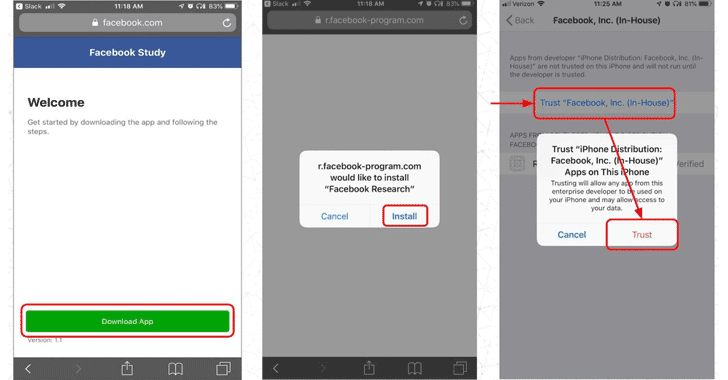 Onavo Protect became a data collection tool for Facebook helping the company track smartphone users' activities across multiple different apps to learn insights about how Facebook users use third-party apps. Now according to a report published by TechCrunch, Facebook has been doing much more than just collecting some data on its users—this time in the name of an app called "Facebook Research" for iOS and Android since at least 2016. In some documentation, this program has been referred to as "Project Atlas." Facebook has also confirmed the existence of the app to the publication. The report said the company has been paying people aged between 13 and 35 as much as $20 per month along with referral fees in exchange for installing Facebook Research on their iPhone or Android devices, saying it's a "paid social media research study." While acknowledging the existence of this program, Facebook said, "like many companies, we invite people to participate in research that helps us identify things we can be doing better." Since Facebook Research is aimed at "helping Facebook understand how people use their mobile devices, we have provided extensive information about the type of data we collect and how they can participate. We do not share this information with others, and people can stop participating at any time."